That’s 81.2 percent spent on one candidate. 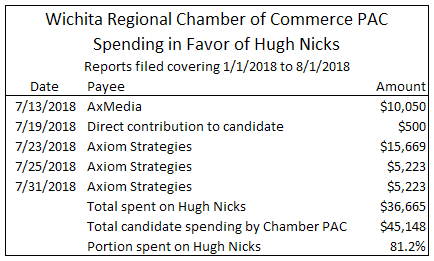 Instead of denouncing the lies and distortions told on his behalf by the Wichita Chamber PAC, candidate Hugh Nicks embraces the PAC’s endorsement. If Ranzau wins the GOP primary election the insiders with their crony deals will have another statist candidate to back in November. Constitutional conservatives like Ranzau must be removed so the good ‘ol boys can tap into the taxpayer money at the courthouse. the chamber in Wichita is a disgrace.